(Fig.141FG) inlet connections. 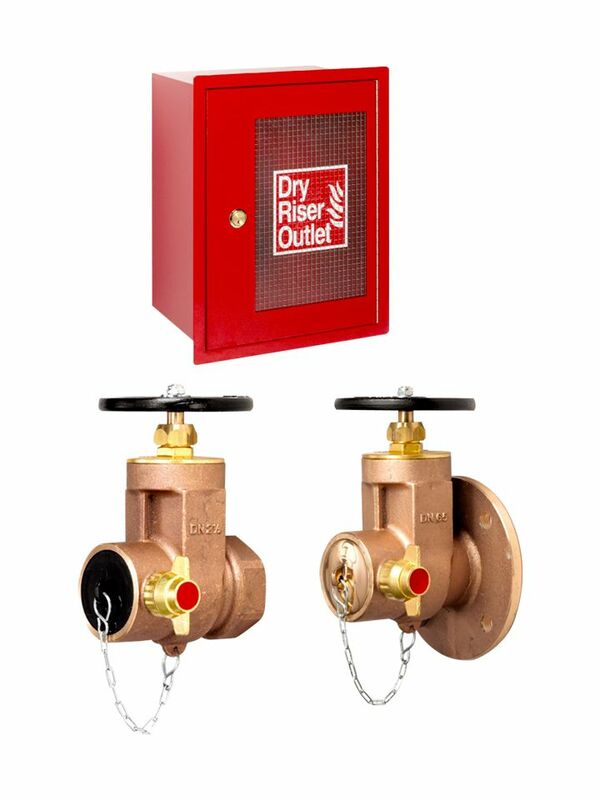 This valve is generally intended to be installed in a building dry riser system. The design and construction of the hydrant valves are strictly in accordance with BS5041 : Part 2 : 1987 and generally to BS5154 : 1991 standards. The selection of materials in the manufacturing of the valve are all of corrosion resistant, tough and durable. This ensures the product long-life plus providing an efficient service in the time of need. The valve metal to metal seating are precisely machined so as to provide the shut-off of the valve to have a water-tight sealing. Every hydrant valve manufactured is hydro statically tested to 16.5 bars and 22.5 bars for the valve seat and body respectively. (“Red” is optional) plastic blank cap and chain. Alternative blank caps made of aluminium, brass or gunmetal are also available on request. • Precise machining for metal to metal seating provide leak-proof. Table D or E or ASME #150 flange.